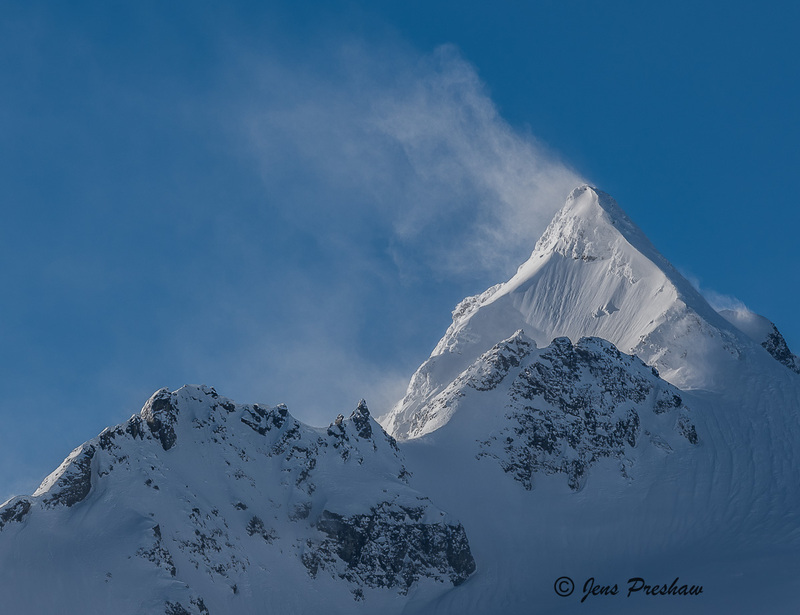 In Joffre Lakes Provincial Park strong winds on the summit of Mount Matier ( 2783 m ) created this snow plume. Below the mountain lies the Anniversary glacier which is popular with backcountry skiers. 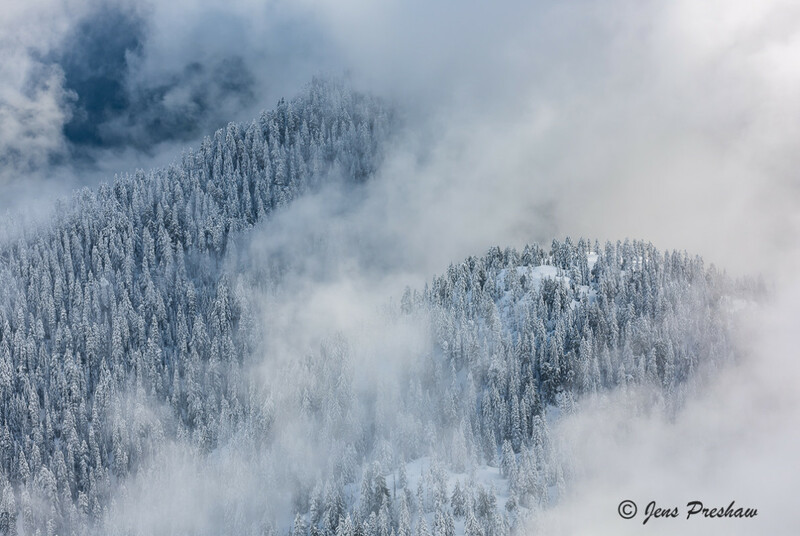 It was a beautiful cold morning with lots of fresh snow. Click on the photo to see a larger version. 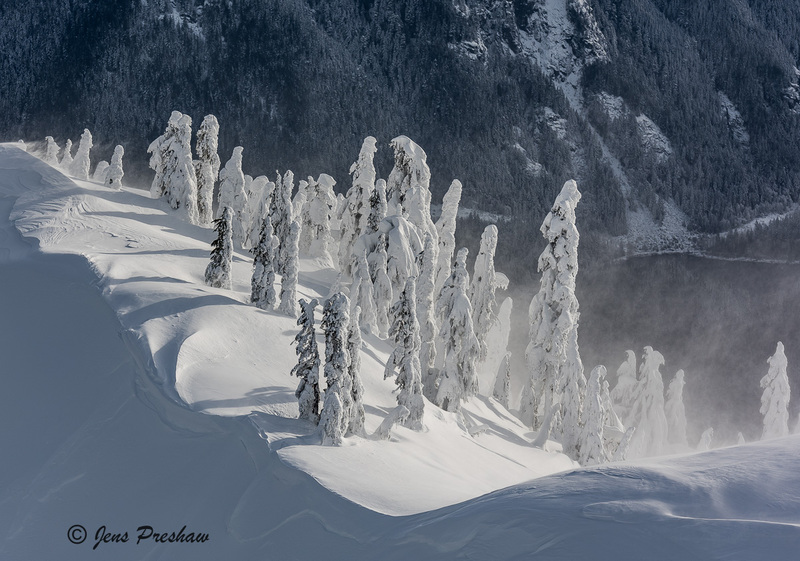 This morning I snowshoed to the top of Pump Peak which is the first of three peaks on Mount Seymour. After the snowfall on New Year’s Eve there was lots of fresh snow on the trail. On the summit I was pummelled by high winds and blowing snow. As I headed up the trail, overhead flew the helicopter that rescued two skiers who went out of bounds on December 31st. They had contacted North Shore Rescue by phone and were told to stay put at a supply cache. After spending the night in ‘Suicide Gully’ they were picked up by the helicopter this morning. 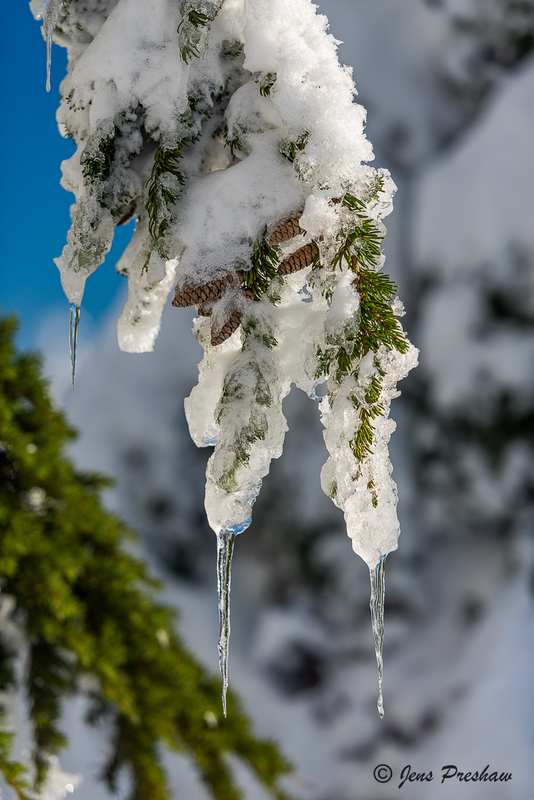 It must have been a cold night for the two skiers. Click on the photo to see a larger version. 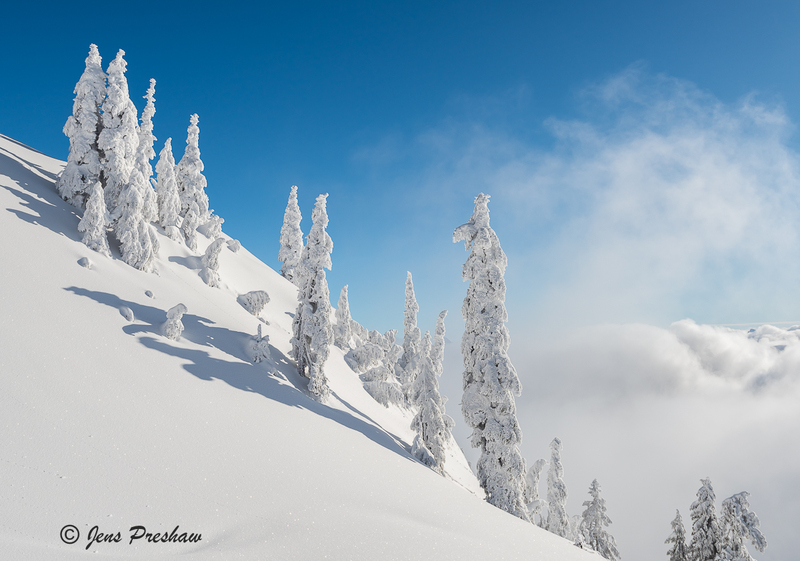 A great day to snowshoe to the top of Hollyburn Mountain or Hollyburn Peak. It’s about 7 kilometres round trip and 450 metres of elevation gain. You get a nice view of The Lions which is a pair of pointed peaks along the North Shore mountains. I enjoyed snowshoeing early this morning through the beautiful snow ghosts. Click on a photo to see a larger version. Last night we received some heavy rain in Vancouver and I knew it would be snowing in the mountains. 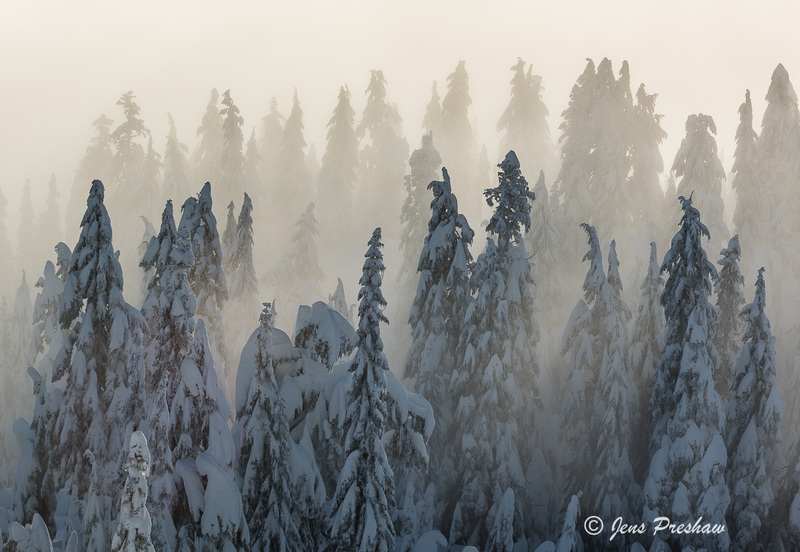 Early this morning I snowshoed up to the summit of Mount Seymour and it was difficult breaking trail and carrying all of my photography equipment. 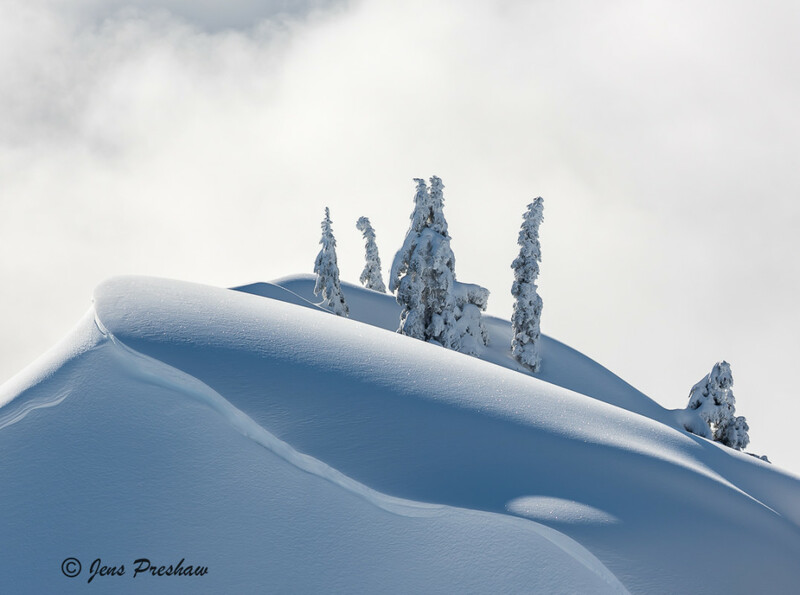 However, it was worth the effort because as the sun rose the clouds started to burn off and combined with the fresh snow it created great conditions for photography. 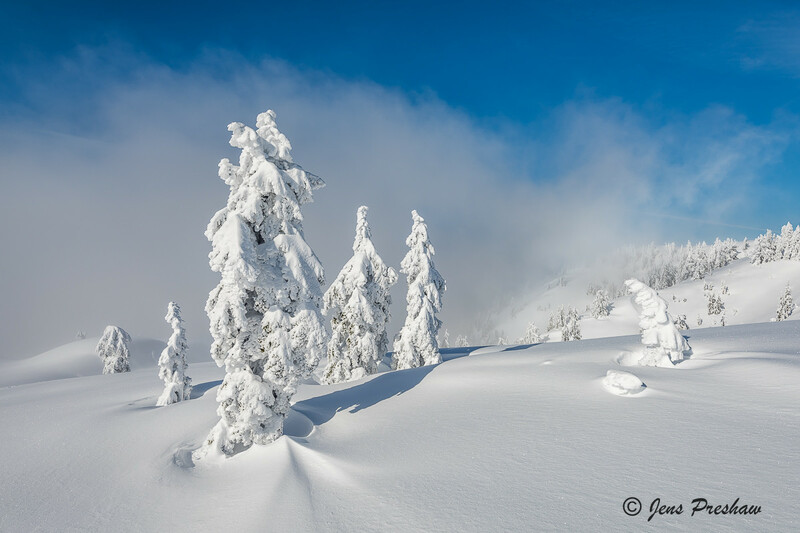 On the summit where it receives the most snow and the winds are strongest there were some beautiful snow ghosts. It was a great day and after all that exercise I will sleep well tonight. Below is an Envira gallery of images. Click on the first photo in the top left hand corner and then use the left and right keys on your keyboard to move through the gallery of images. 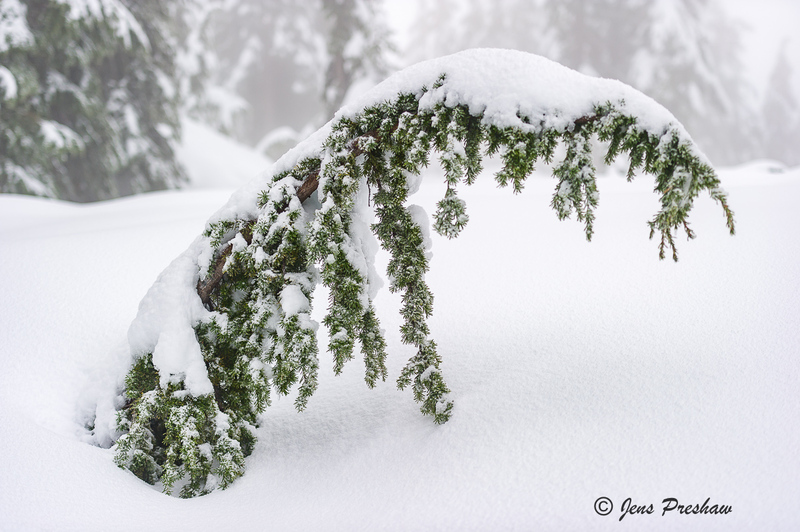 This morning I went snowshoeing even though the weather conditions didn’t look very promising. There was dense fog and driving snow which looked like fertilizer pellets on my jacket. As I snowshoed up the trail it was quiet and peaceful. Since the sky lacked any interesting details I focused on creating images that were simple, which is often difficult to do in photography. 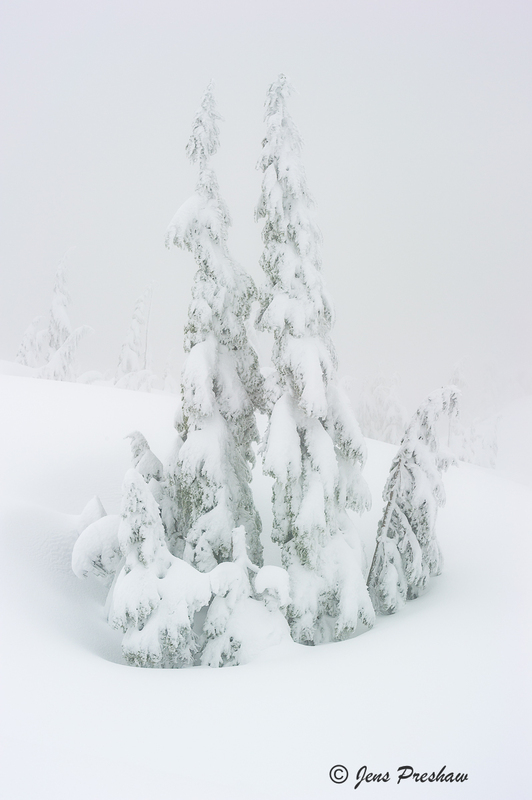 I spent most of my time taking pictures of the snow covered trees. 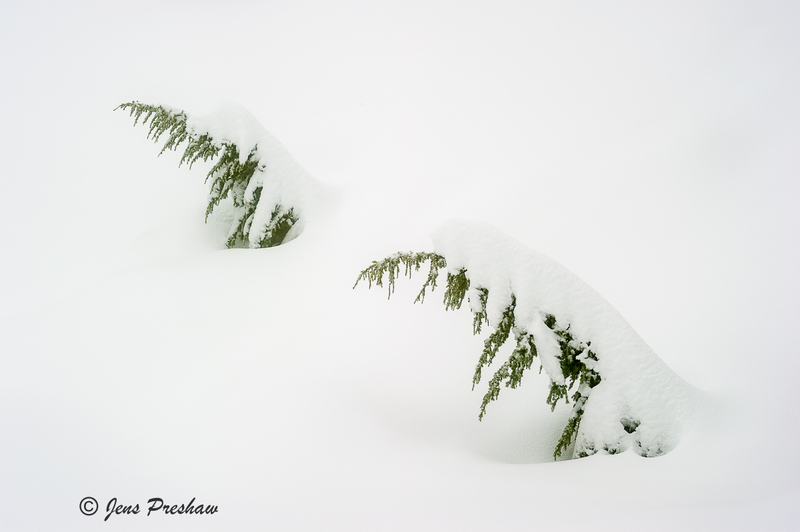 Some of the smaller ones bend over due to the weight of the snow. Click on an image to see a larger version. 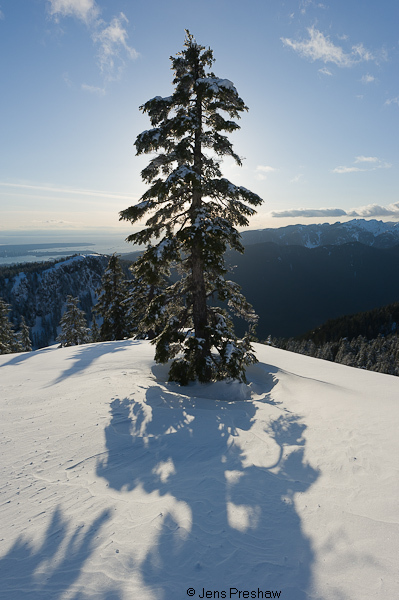 Today I snowshoed to the top of the second peak of Mount Seymour. 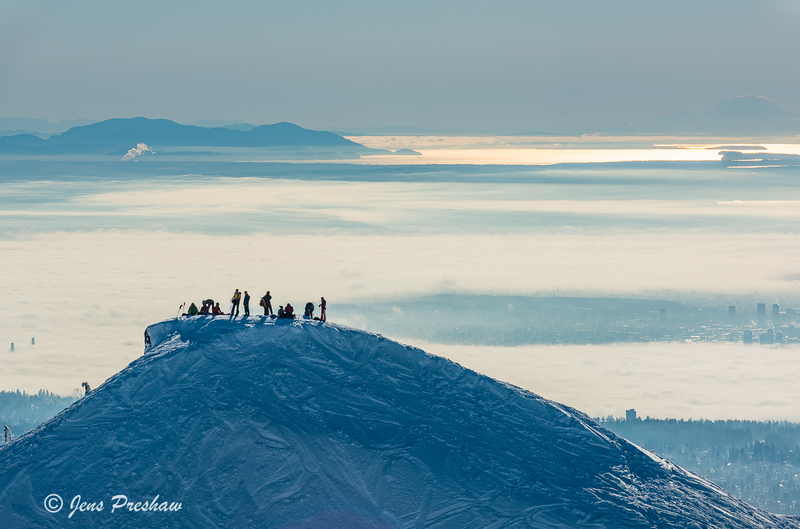 I took this photo, looking back and down at people on the first peak. 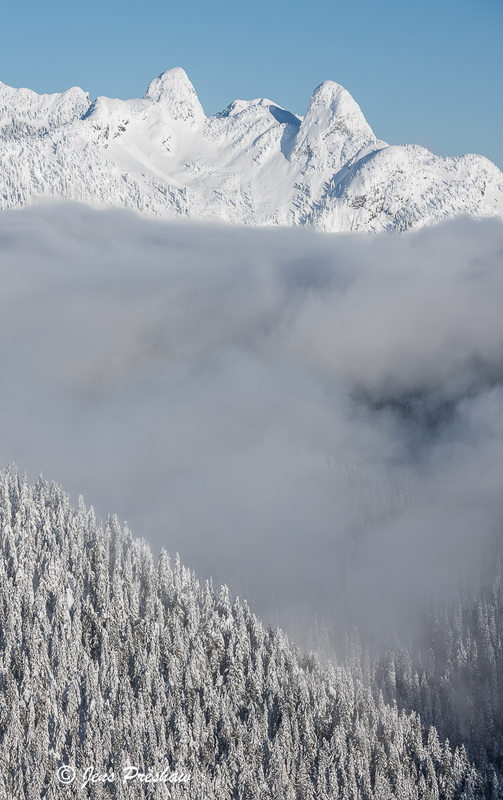 While most of the people in the lower mainland were driving around in the fog. I was in the sunshine, enjoying a wonderful view, while eating my lunch. At nearly 5000 feet a sandwich and milk chocolate tastes like heaven. Click on the image to see a larger version. 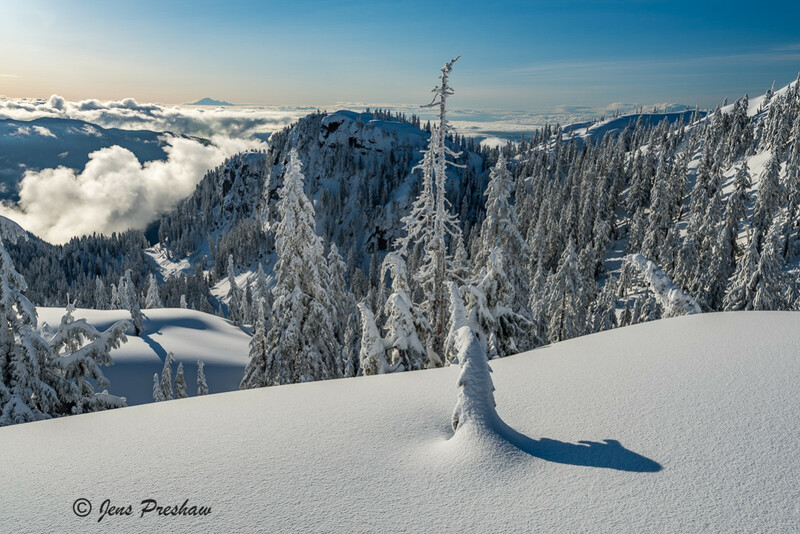 On the last day of 2015 I did some snowshoeing in the Coast Mountains. 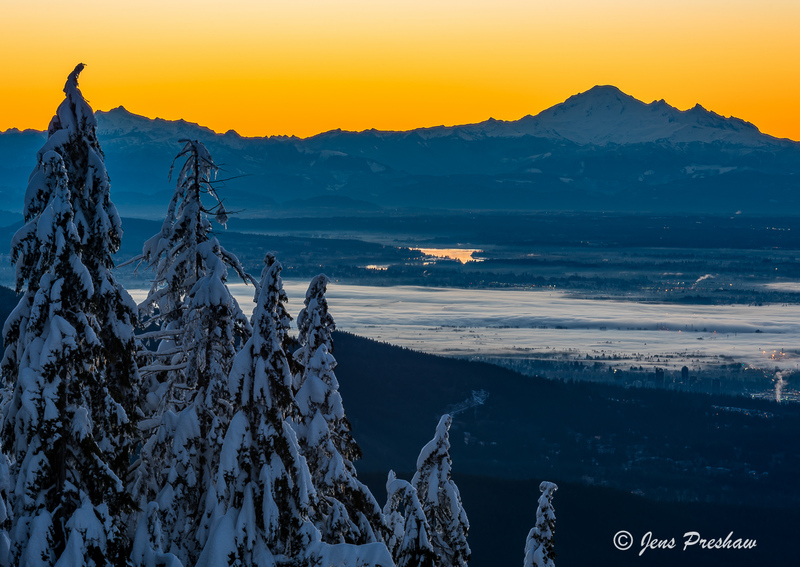 I witnessed a beautiful sunrise behind Mount Baker. Down in the valley there was some morning fog. I’d like to wish everyone a happy new year and all the best in 2016. Click on an image to see a larger version. 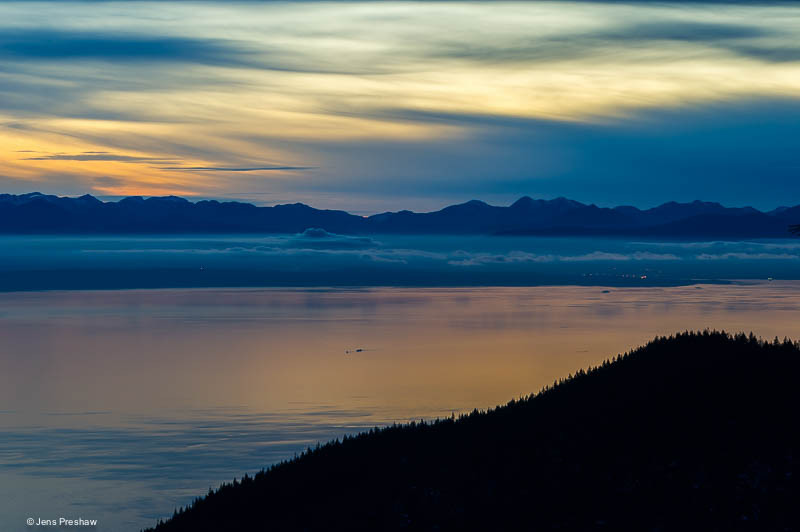 An image of the Strait of Georgia taken at sunset. 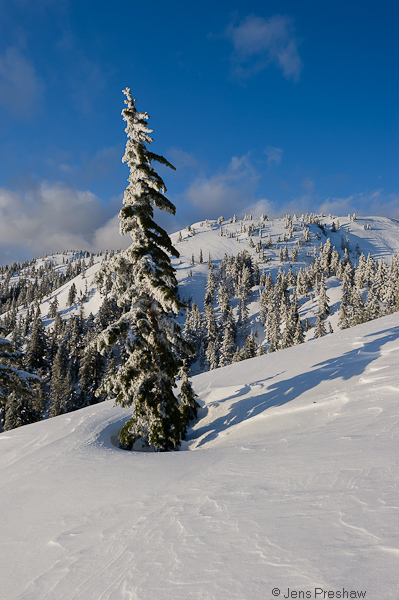 I snowshoed up to this location and it was a great way to spend the first day of 2015. However, not everyone had the day off like the tugboat captain hauling the barge in the photo. In the distance you can see the mountains on Vancouver Island. I like the golden colour reflected in the water and the black silhouette of the trees in the foreground. It was dark as I descended to my vehicle. This week I was able to go snowshoeing on a weekday. There wasn’t the crowd of people you experience on a weekend, I was able to find a parking spot relatively close to the trailhead and there were fewer hikers on the trail. It was cold, windy and my hands froze operating my camera. On the way down in the dark walking along through the trees, the trail illuminated a few feet in front of me by my Petzl headlamp and the sound of my snowshoes crunching on the snow, I realized how spending time in the wilderness balances and enriches my life. What a great day. 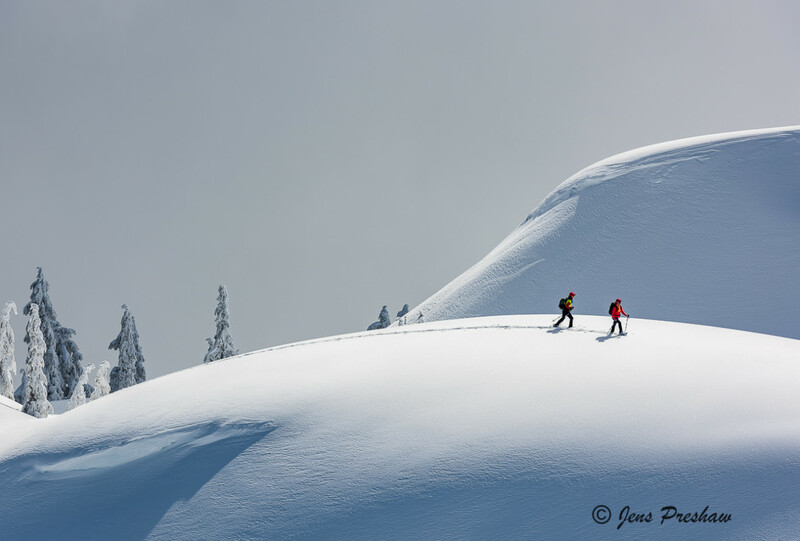 Snowshoeing on a sunny winter day. I usually don’t take images at midday because the light is so harsh. 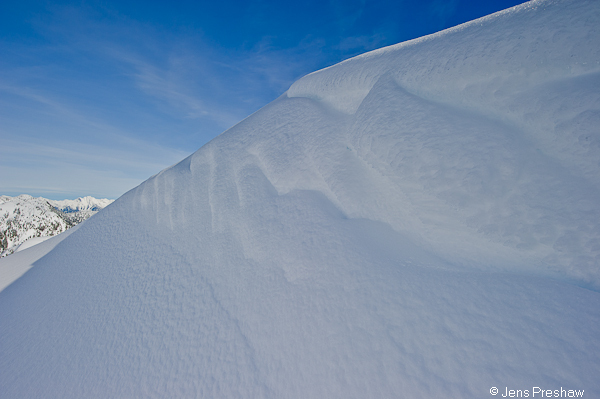 However, this snowdrift allowed me to play with its shadow and the blue sky in the background.